Set up classroom centers around the room and organize them all with this convenient corrugated storage unit. This unit is versatile and will work with math centers, literature centers, art centers, listening centers and many more. It has a vertical shelf (2" x 12" x 11.63") and three horizontal shelves (10.38" x 12" x 2.38") perfect for notebooks, folders and papers. 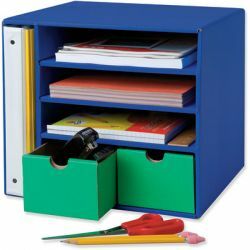 It also has two drawers (4.88" x 11.25"" x 3.5") that work great for storing pencils, staplers, crayons, flash cards and much more. Recycled and recyclable.